We all must have heard this advice thousands of times when considering a career move: follow your passion. But what does it mean exactly? Firstly, not everyone has a clearly defined passion. In fact, I suspect most people don't have a single defined passion or a handful of passions to follow; or if they do, they are not consciously aware of these. Secondly, even if you have a passion - say, collecting stamps - how to turn it into a career? One of my passions is learning. I absolutely love reading all kinds of books from fact to fiction and my most cherished childhood memories are about trips to the local library to borrow more books from this miraculous Wonderland of Stories. But, who on earth would pay me for reading books? Or hire me to be a life-long student just for my own interests' sake? Sadly, no one (or I simply haven't figured the right path yet...). But does this mean passion has no place in work life? Nope. It just means that passion needs to be redefined. List all the jobs you've ever done, including student jobs and summer jobs (if you don't have at least five jobs, list also volunteering gigs or jobs you'd like to do). Pick a top 5 list of your jobs based on which ones you enjoyed the most (or at least to some extent). Put the five jobs in order, from the most enjoyable to least enjoyable. Dig out what exactly in each job made you like it. Was it the work environment, the job content, the chances to learn, chances to interact with customers, flexibility with hours, what? Then dig one step deeper. List why exactly you liked the said positives? How did they make you feel? Which positives made you feel the best? Why? For example: if you liked interacting with customers, was it because you felt you made a difference in someone's life? When you write down a positive emotional element that makes you feel elated, or your spine shiver (or in the strongest scenario, makes you cry), you've hit the nail in the head. That's what you yearn - that's what to get more in your life. The purpose of this exercise is to identify the exact emotional element of life (and work) that makes you feel alive, driven and happy. As mentioned, passion is not so much about doing a certain activity or engaging in a pastime but what that activity evokes: what emotion it triggers and nurtures. And ta-dah, because passion is not an undertaking but a feeling, it can be integrated in the work life, too! Now, let's bring tarot into the equation to explore the idea of passion a bit more. 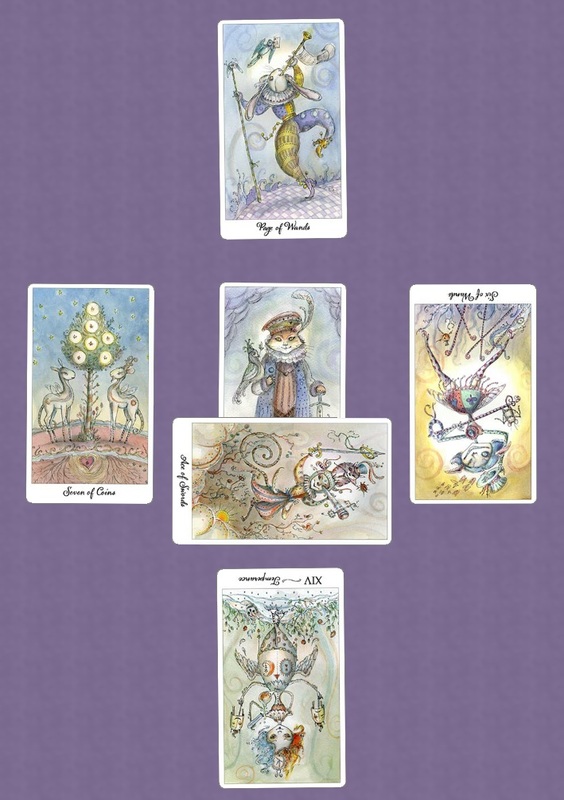 Joie de Vivre deck by Paulina Cassidy comes with a spread called Spread the Joy and its purpose is to identify what brings you joy. Joy and passion are, if not interchangeable, at least closely related to each other. What brings you constant joy usually is your passion, i.e. a pastime that you enjoy and do even when no money is earned. 0 - What is joy to me? 1 - Where to find joy the easiest? 2 - Where must I work to find joy? 3 - What am I allowing to block the joy? 4 - Who or what could teach me to experience more joy? 5 - Universe's gift to experience joy? Spread the Joy, Paulina Cassidy, Joie de Vivre. Published under permission. 0 - what brings me joy is KING OF SWORDS. This is no surprise, as the King is the master of thought, logic and intelligence, and also an authority and mentor in these areas. My joy is deeply seated in my feeling of mastering logic and thought, understanding issues (as a reward of learning), and spreading my thoughts and ideas via this blog, for example. 1 - where to find joy is 7 PENTACLES. My joy comes from all sorts of learning and communication projects, big and small, in various stages of completion. I thrive on recognition and reward, so an occasional reward apple dropping from that pentacle tree keeps me going. And I always have to have a project of some sort going, I love the feeling of seeing where things can go and working towards a goal. Completion in itself is not the reward, but having these projects underway is. 2 - where I should work to find joy: PAGE OF WANDS. Explore creativity and newness, embrace adventure. Yes, please :) That most definitely is the area where I find joy: exploration, both physical and mental. I love travelling both in my head (to different worlds of books) and in real life. And I love brainstorming new ideas, even though only 10% of them actually lead to somewhere! 3 - what am I allowing to block the joy: 6 WANDS REVERSED. As mentioned, I thrive on recognition, and lack of recognition is the biggest turn-off for me. Why am I doing this if nobody notices, my ego yells. I should learn to remember that nobody needs outsider validation for their passion: passion is a passion because it brings inner joy, not publicity or fame. 4 - what could teach me to experience more joy? TEMPERANCE REVERSED. This is a cryptic card in this context at a first sight. Less compromise, less balance, less mixing things that don't mix easily? I take it to mean that I should align my life all and all in a direction that allows me to experience more joy, without having to compromise so much. My current bill-paying job is far from my passion and I'm only free to explore my passion out of office hours. Point taken. 5 - gift from the Universe? ACE OF SWORDS REVERSED. This card at a first sight is not the most uplifting. I've been toying with a new business idea and this card seems to slam it to the ground: will not work. However, as I strongly believe in my idea (and my previously consulted cards also support its success), I'm inclined to take this card to mean something else: possibly my husband and his razor sharp yet playful wit and intellect, because this card sometimes comes up as him. Reversed cards in my readings often mean: not you, someone else, i.e. this is not my bright idea, but his. It could also mean that the idea I have now is not yet mature, but it will be with time - the reversed card "wants" to turn upright. I'll stay tuned for even better ideas than my current one then!